I heard the sound of a train blowing from not too far away. Except for the last month, it is a sound I have not heard for a long time; not since living in Provo anyway, nearly a lifetime ago. It is a lonely sound and matches my mood. Towns in the northwest feel old. They make me feel like I am stepping into a long past era held for posterity like a natural museum. 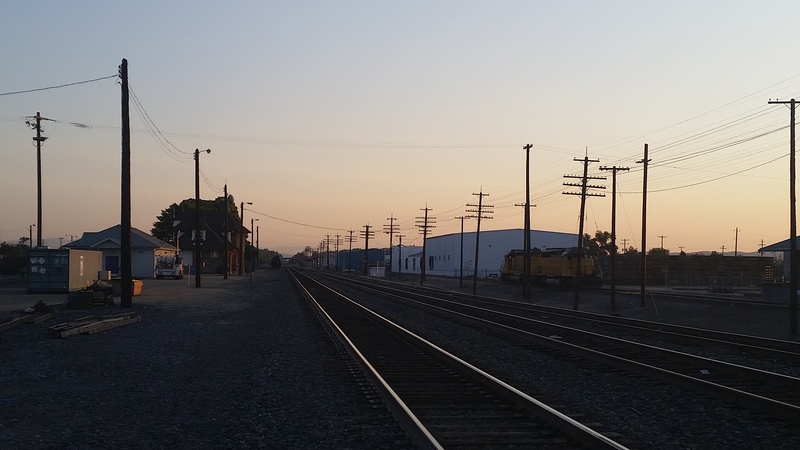 Small northwest towns are not quite ghost towns, but they make you feel like you are walking among ghosts; places where both the living and the dead cohabitate. Strangely, they give me the comforting sense of being inconspicuous as if I am nothing more than a nameless face on a page of history. It provides a certain solace for a desert dweller because everything in the desert is conspicuous under the watchful eye of the sun: the sparse vegetation, the elusive wildlife, the embarrassed and evasive streams and water sources – everything is made clear and visible in the desert. It is almost a cliche to say that the desert is a land of extremes, but it is: extreme heat, extreme thirst, and even when moisture comes, it comes in an extreme fashion. Perhaps that is why the desert never feels old. Nothing stays the same and nothing really lasts. It’s a transitory place. Even the towns seem temporary, as if they appeared out of nowhere and could disappear at any moment. The nature of the desert, as still as it is, seems to be one of constant motion, everything struggling for space – one thing pushing against another in order to stretch, to anchor somewhere in its struggle to survive, to stay put. The very ground is restless and even the water clings hopelessly to it as it gets swept away. 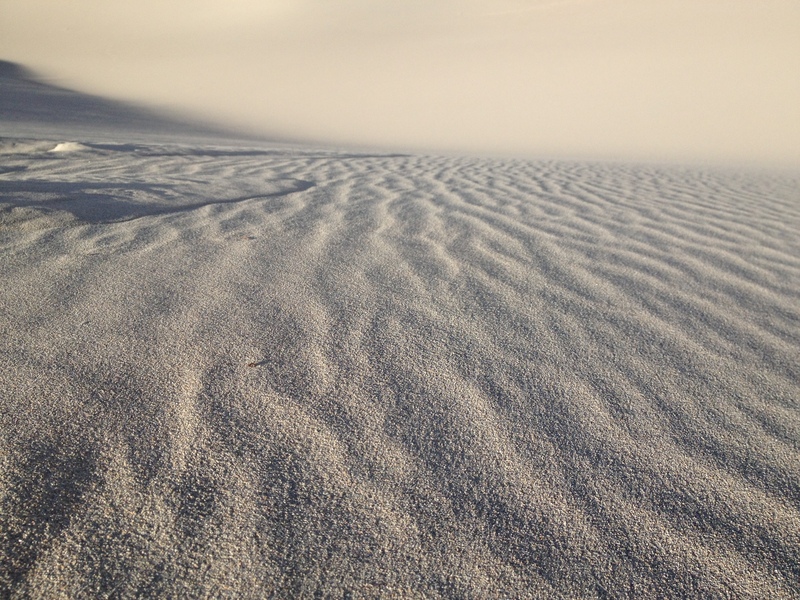 Perhaps it is the struggle for life that gives the desert its ethereal quality. Because it is constantly in a violent state of change and renewal it leaves a mysterious feeling of metamorphosis. Most of this change comes during the monsoons, magnificent storms that are synonymous with summer and that you feel before they arrive, like a seasonal cue that water is coming. But the desert does not abide much water. It becomes saturated with it quickly and because a little bit goes a long way anything beyond what is necessary gets rushed out as quickly as it came. And like the desert, those who live in it, while used to the extremes, also quickly over-saturate and wonder who has allowed the ocean to overstay its welcome with too much water and grey skies. Last summer I woke to a titan of a monsoonal event, the crack of thunder and rain so loud it sounded like Niagara Falls outside my window. I peeked at the alarm clock: 4 am. After tossing and turning but not being able to go back to sleep, I got up. I flipped the television on to reports of freeways turned to rivers, road closures, and statistics stating it was the fourth heaviest day of rainfall on record for Phoenix. So much for getting on the road early, I muttered as I watched images of stranded cars appear on my T.V., their hazard lights blinking just above the accumulating water. I love desert thunderstorms but not when they leave me stranded, so I paced liked a caged animal in my hotel room, periodically walking outside to stare at the rain as if I could somehow will it to stop. I finally decided to brave the raging tempest to see if the nearest Starbucks was open and wait for the weather to let up while I sipped coffee and read a book. A couple of hours later, despite freeway closures and warnings to stay inside, the rain relented enough that I decided to take my chances and head home. I needed to get back to St. George. I checked the radar and saw that the storm was headed straight for Flagstaff and what looked like a path into eastern Utah. Since it looked clear through Las Vegas, I chose that route; my only obvious obstacle being Phoenix. It was slow going and I was detoured due to closures, but by the time I reached Sun City it was smooth sailing. I floated through non-descript towns heading home, dark clouds and grey sheets of rain hung all around me highlighting the passive desert landscape below. Everything looked peaceful outside my windows until about 20 miles outside of Vegas. Right when I thought I would be home soon, I hit a wall of rain. I couldn’t see more than five feet in front of me and when I was about to pull off the road I hit stand-still traffic. I couldn’t see a thing. I squinted through my windows at what looked like a massive river raging to the right of the freeway. Surely the rain is playing tricks on my mind, I thought, trying to make sense of what my eyes were seeing. As the minutes ticked by the storm formed another river on my left that started creeping across the southbound lanes of the freeway and filling the ditch just next to me. Water was slowly surrounding me – and rising. My annoyance and anxiety were increasing with each minute. I watched in horror as construction debris got washed away right next to me. After nearly an hour, the water that had slowly made its way across the freeway started licking under my car. “To hell with this,” I said. I put my car into gear and drove up a closed off lane of the freeway to get on higher ground. A few minutes later an officer walked up to my window and asked if I would pull my car up as far as I could go so that they could get the vehicles behind me up on higher ground as well. Minutes later the road behind us disappeared beneath an angry, red deluge of water. We were surrounded on all sides. People started getting out of their vehicles to find out what was happening, everyone recording or taking photos of the carnage. I figured the crews and law enforcement would get traffic going eventually, so I sat back and relaxed. Little did I know I would be stranded on that concrete island for nearly five hours. 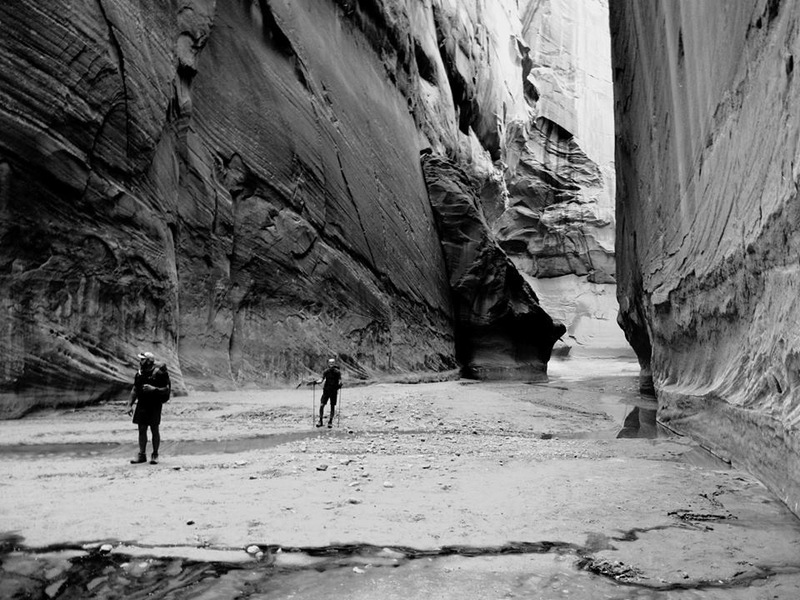 As I sat there marveling at the power of water, my mind turned to slot canyons, subterranean cracks in the earth offering mystery and delight for backpackers and canyoneers, turned into terrifying death traps when storms roll in. I hope no one’s in a canyon right now, I thought. One of my worst fears is being trapped in a maze with water and debris hurtling toward me and nowhere to escape. 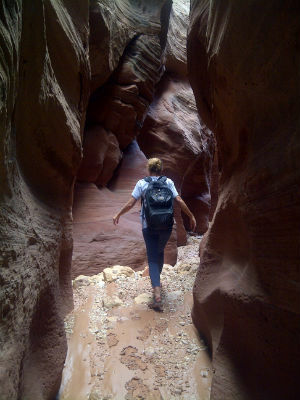 If there is even an ice cube’s chance in hell of rain I will avoid slot canyons. I half chuckled to myself at the irony of finding myself in a similarly precarious situation on a wide open stretch of freeway. I thought back to my trip through Buckskin Gulch a few weeks prior when the thought of something just like this had consumed me. I had accepted the coveted invitation in triple digit weather because there was not a sliver of a chance of rain, just the threat of dying from dehydration and heat stroke – both of which I felt adequately prepared for. We had camped at White House campground with some friends to get an early start the next morning. We left a vehicle there for our exit at the end of our hike and headed to Wirepass Trailhead the next day. The short one mile hike through the Wire Pass Narrows looked like child’s play once we entered the yawning mouth of Buckskin Gulch. 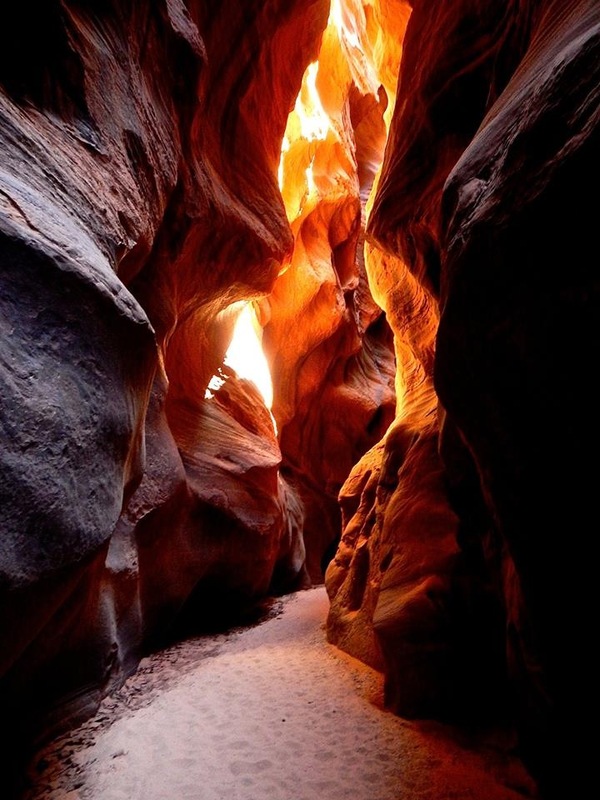 Nearly all 13 miles of Buckskin Gulch is a slot, with few openings for escape or direct exposure to the sun. It is one of the longest slot canyons in the world and looks as though someone or something has taken a giant scalpel to the earth’s crust. In between conversation, when we ceased talking and silence overcame us, my mind started forming a southwest version of a Greek myth: the mortal heroes begin their journey into the underworld while the gods watch from above, some scheming havoc while others prepare for intervention. In my unfurling drama, Poseidon would be in our corner. No need for rushing water here I thought. Flash flooding was the topic woven through all of our conversations and around each bend we would stop and look to see if our climbing skills were honed enough to get higher than 20 feet of water in a short burst of time. The threat of being surrounded by 400 foot walls with water rising quickly was ever present in our imaginations. The gods envy us, I mused, recalling Achilles’ words, because we are mortal, doomed; we will never be lovelier than we are now, we will never be here again. Do the gods envy us? I wasn’t so sure, but the essence of that quote was true enough. The canyon was stunning, breathtaking, and dangerous. I wasn’t sure if I would ever be there again and so I basked in it. I didn’t even take many photos because I didn’t want to miss the canyon for photography. We gazed at the walls that at times looked like petrified ocean waves and at other times like skyscrapers. We found natural vents that blew cold and hot air and would look around at each other and exclaim, how the hell? And the sand, the never ending torture of inefficient sand. After roughly eight miles of walking in it I thought, so this is how we will die: we will die of thirst because the sand is slowing us down so much it’s making the hike take twice as long. We will run out of water before we reach the spring. Though there was no chance of rain, death pressed in on us, lurking in the dry air, ever present. We came across carcasses of birds and deer, mangled and broken bodies left as reminders that life is dangerous – that life in the desert is dangerous. 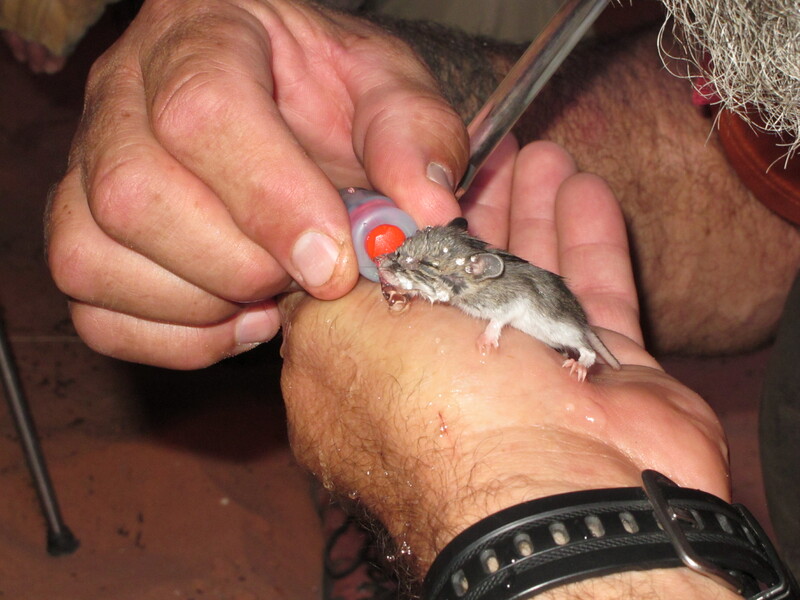 We caught a little canyon mouse half dead for lack of water and watched in amazement as drops of water revitalized it the moment the water touched his mouth. We wondered aloud how long he would survive – how anything could survive in this canyon for very long. Though I hadn’t had much water most of the hike, by the time we reached Middle Trail (which we aptly renamed Last Chance Trail because it is an escape route) I was sucking my eight liters of water so fast I started worrying I would run out. Though I had rested, even took a nap in the shade and then leisurely gazed at petroglyphs during our lunch break, the thirst was all consuming. I couldn’t drink the water fast enough and anxiously hoped the reports we received were right, that the springs had water in them. We still had miles to go. Luckily for us, the reports were accurate and we were able to refill our water when we got to camp. That night we crawled into our sleeping bags under a million hanging stars and silence as deep as our bodies were tired. But the initial silence was broken with the screams of something in the darkness – something hunted and preyed upon. Another reminder that life and death are not so distinguishable in the desert. After the screams died down and the silence resumed we fell into an uneasy sleep. The night never got cool and we woke to the radiant heat of the sun baking the red walls of the canyon. The confluence was not very far from our campsite and we reached it not long after our easy camp breakfast. As we stood underneath the towering walls it seemed like we had been swallowed up in the belly of a sandstone whale, the only glimpse of sunlight coming straight up through the spout. Nothing existed but the chasm. It was overwhelming, even eerie. If water came rushing down Buckskin and the Paria there would be no safe ground, no escape from the collision of those two trains. I had never felt so small and insignificant – like the world had ceased to exist and all that was left was us and the canyon. Sitting stuck in traffic on I-15 I shuddered at the thought of being at the confluence of those two drainages during this storm. Though the torrential downpour had abated, it was still lightly raining and the night had slowly come. I snapped out of my reverie when break lights lit up the darkness. It looked like we were finally going to move. To my chagrin, they had cleared the road enough to turn all traffic back to Las Vegas. 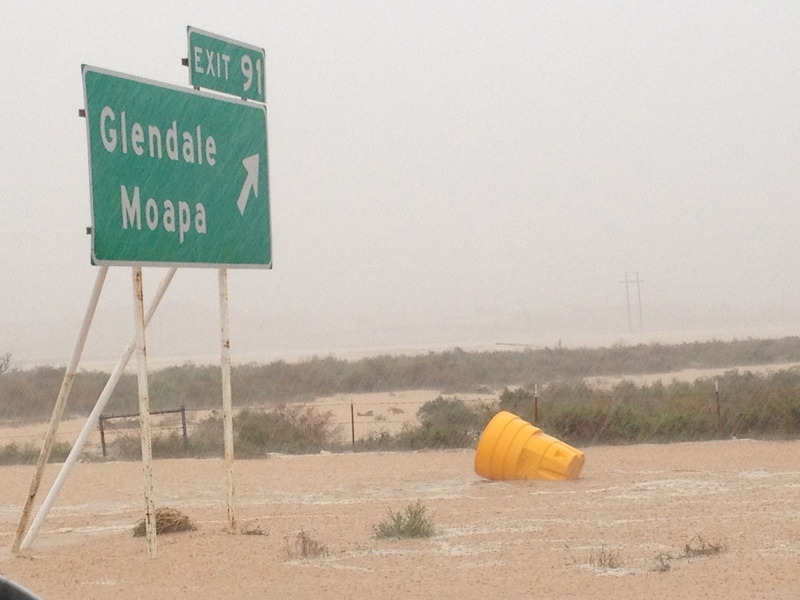 The water had come so violently it had washed out I-15. There was no getting home tonight. I spent the night in a dumpy Motel 6 and made the six hour drive home the next day on a detour route through the Nevada desert. Remnants of the storm were everywhere, making the land look more like a marsh than a desert. When I got back to St. George and it was still raining, I did what I never do: I cursed the rain. They say you can never complain about water in the desert, and for the most part that is true, but the abundance was excessively rich, opulent, and lavish; like a decadent dessert after fasting. It was too much. I got back to reports of cars getting swept away by the impetuous and voracious rivers; of road construction equipment getting smashed against canyon walls in the Virgin Gorge; and heard miraculous stories of survival. But another storm came through a few days later and was not as merciful, catching two hikers in The Narrows and drowning one. We are both witness and casualty in the epic battle that ensues when the enduring patience of the serene sky wears thin and like an angry lover, breaks into revenge on the aloof and detached desert. 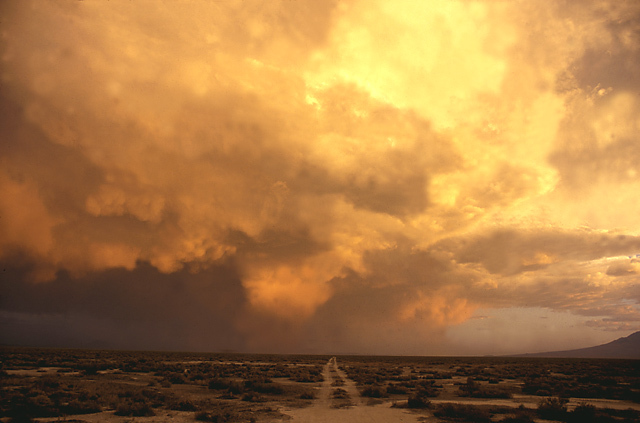 The temporary fury unloads as the sky forces the land into submission with ravaging and torrential lashings until exhaustion and retreat are the only sensible response to the maddeningly austere and spartan desert – and anyone or anything left standing. I think Steinbeck said it best when he mused in his travels with Charley that the desert might well be the last stand of life against unlife. The desert does not tolerate much and so it is an audacious stand to insist on living here. It is the nature of life in the desert to stand apart, alone, because there is so little to go around. And that is perhaps the difference between living here or some other place. In the northwest, mid-west, northeast, and even southeast, the environment seems static and unchanging because everything is always growing, thriving; life crowding upon life. There is a constancy or fluidity to the landscape that gives it a sense of time and linear existence. It feels comforting because it appears changeless, and to a desert rat, it offers a brief reprieve from the tension and struggle that living in the desert inflicts. But despite vacations and reprieves, audaciously we stand, tenaciously clinging to this restless land. Posted on August 13, 2015, in Nature and the Environment and tagged 1-15 washed out by flooding, backpacking in the desert, Buckskin Gulch, death in canyons, desert rat, flooding, Las Vegas, monsoons, northwest towns, Paria River, Phoenix flooding, slot canyons, southern utah, the desert. Bookmark the permalink. 2 Comments. Nicely written Greta. I was born and raised in the Mojave desert. I didn’t think much of it then, but as I return and visit, I realize the life there is harsh. It’s been nearly 20 years since I saw you last, but you look great. Wow…what a surprise! How are you? It’s great to cyber-bump into you. And thank you. I’d love to catch up and hear what you have been up to if you want to shoot me an email.